Lure Coursing is quite famous among the Afghan Hound breed. It is a beloved sport that provides the dogs with a lot of exercise and mental stimulation. For the dog, it is pure adrenaline fun! 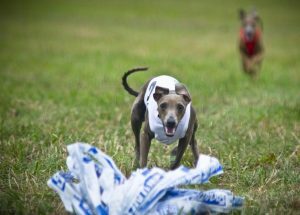 Lure Coursing is a sport for dogs where they chase a lure that mimics a small prey running. The lure is attached to a pulley that is either mechanically controlled or hand controlled by someone. This is a recreational sport that promotes social gatherings of dog owners while providing an activity for the dogs. Not only is it fun, but it’s healthy for the dogs! 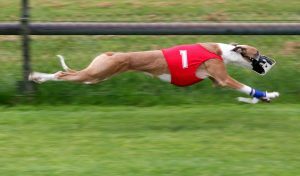 Where did Lure Coursing Come From? This sport began as long as four thousand years ago in Egypt. By the middle ages, Lure Coursing was restricted to royalty only and was not something the commoners were allowed to do. They were not even allowed to own a sighthound for a very long time. 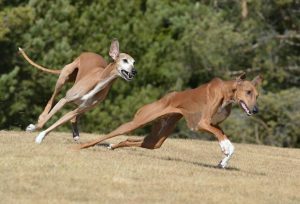 Sighthound dog clubs in California devised controlled coursing in the seventies that is still used today. Not only was the coursing portable, but it worked in a controlled environment that was safe for the dogs. The mechanical lure is made up of plastic bags and faux fur. When the dogs see this, to them it looks like the real deal! Who knew a plastic bag and fake fur would pass for a rabbit or something similar? A mechanical device controls the speed which the lure travels at as it is dragged across the ground. It can be set up to take turns or change direction. These zigzagging patterns imitate how small prey runs when trying to escape. There are many Lure Coursing clubs across the country as well as worldwide. It is restricted to Sighthound breeds only and the dog must be AKC registered. Dogs must be a minimum of one year old. United States has a standard Lure Course that measures 600-1000 yards long. European Lure Courses are over 1000 yards long and include the use of jumps and obstacles. Dogs are scored based on speed, endurance, agility, enthusiasm and ability to follow the lure. You can find a sanctioned club by contacting The American Kennel Club or The American Sighthound Field Association.